Tim takes a fiery trip into the Doom beta to see just what it’s like – and who, exactly, this game was made for. Let’s face facts: unless you’re making a sprawling, hundred-hour-long epic like the Fallout 4s of the world, if you want your big triple-A action game to have any sort of hope or longevity you need to throw in a multiplayer mode. And it had better be damn good to lure people away from the Battlefields, Halos, and Call of Dutys of the world. id software, the legendary studio behind Doom, Quake, and Commander Keen, understands this better than most, to the point where they’ve released two entire games (well…one and a half) strictly focusing on multiplayer that still retain a solid playerbase to this day. Of course, player tastes and design trends are far different now than they were in the halcyon days of Quake III Arena, and if any shooter has hope of claiming their share of the marketplace they need to be able to keep up with what players want…or at least what sales figures claim they want. 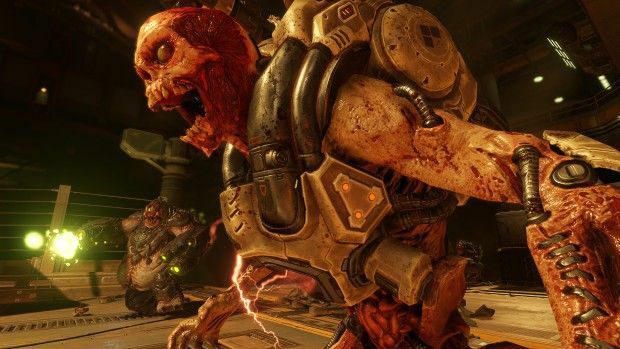 Some twelve years after the previous title in the series, Doom has a lot on its plate: it has to both draw in the modern-day shooter crowd and not alienate its core fanbase, a portion of which have been with Doom since it was a MS-DOS title. 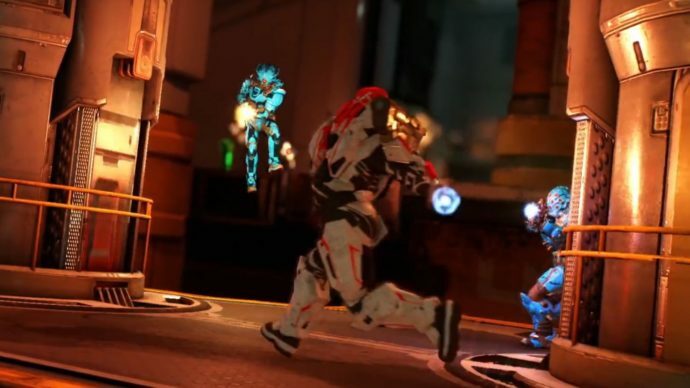 When id opened up access to their multiplayer beta over the weekend, curious onlookers had the chance to see for themselves if Doom could remain relevant and interesting in 2016. And it was mostly successful…mostly. I know, neither of these guys are green, nobody has a chainsaw, and there’s no lava, but it’s TOTALLY Doom, I promise! Mechanically speaking, Doom hews much closer to the flow and handling of Quake III than it does to more ‘modern’ shooters. You have to pick up health kits and armor shards, just like in the old days (and the loading screen will occasionally remind you of this, in case you’ve gotten spoiled by years of being a bullet sponge), you can double-jump and even climb up certain ledges, and while your default movement speed isn’t quite that of the Quake III/Unreal Tournament era, you seem to cover ground faster than Master Chief or Marcus Fenix ever did. The ability to mantel up the side of platforms helps you avoid a lot of missed jumps and gives the game a verticality a lot of shooters lack, and even if you don’t use it that much, you’ll quickly grow to appreciate how much more nimble your Doomguy is than most other shooter heroes, which is perfectly befitting the overall id software vibe (even if, you know, you couldn’t jump in the first two Doom titles). The weapon selection also feels appropriately old-school in both design and handling. Most of your available weapons are culled from previous id games, from old standbys like the plasma gun and super shotgun, to Quake holdovers like the Lightning Gun, even to Doom-ized versions of things like hand grenades and sniper rifles. There’s no reloading, because there wouldn’t be in Doom, and the weapons are all pretty unique even if they take a while to get used to. I myself mostly stuck with the rocket launcher and plasma gun because they were the most useful, but having seen how effectively the other players in my matches were using each of the available weapons, I’d gladly say that each weapon just comes down to personal preference and your ability/desire to truly get comfortable with the strengths and weaknesses. That said, after you get past the throwback weaponry and your character’s maneuverability, you start getting to the more modernized aspects of the game, and by ‘modernized’ I mean ‘the ones most people seem to have a problem with’. In keeping with recent FPS designs, your character has a small degree of customization both physically and ability-wise, at least to a small degree. After every match, you’re awarded a number of Hack Modules, ability buffs, and modifiers that can be turned on between respawns to grant things like extra armor, the ability to see when pickups will regenerate, and the ability to see exactly how much health your opponents still have. None of them are exactly groundbreaking or game breaking, and I spent much of my time turning them on by accident and not exactly enjoying the benefits thereof, but they don’t detract from the experience even if it does come off like a slightly transparent conceit to the modern-day Call of Duty system of ‘perks’ being added to your character. Nothing bad, but nothing I couldn’t live without, really. The biggest hitch in the power-ups tends to come when one of the teams grabs a Demon Rune. Doom includes the ability to transform into one of the game’s various demons – only the Revenant was available in the beta, but the full game promises a much wider variety – and run buckwild through the map, wreaking havoc on all who oppose you. You really, really want to be on the team that gets the power up, however, as the Revenant in its current state is a little…unbalanced, we’ll call it. It is possible to kill the demon and take the rune for your team with some concerted effort, but it takes a lot of work, and in the meantime, the Revenant is basically shrugging off your attacks and one-shotting your entire team. Unless your team is well-equipped, skilled, and good at working together, the sound of the Revenant spawning basically means a free 5-10 kills for the other guys. If you didn’t hate these jerkoffs in Doom 2 back in the day, you absolutely will now. So, half-hearted perks and unbalanced demons aside, I will admit that I actually had a lot of fun with Doom’s multiplayer, but overall impressions seem kind of…divided. And I can absolutely understand why. Some of the more ‘modern’ decisions can be seen as taking away from the old-school arena shooter vibe; the CoD-esque loadouts ruin the ‘everyone starts on equal footing’ concept of previous id titles, the weapons aren’t quite balanced enough to compensate the need to pick up health kits, which can frustrate a lot of players who are used to easily recovering from encounters, and the weapons’ distinct identities and properties require a slightly sharper learning curve than most military-style shooters where the guns can be easily slotted into one of a few categories. It is with this in mind that I’m really interested to see how Doom works out when the full retail version hits, especially after a balancing patch or two. I can absolutely understand why people are having a difficult time deciding if they like Doom or not – it’s in a weird middle ground of being too ‘modern’ for shooter curmudgeons like me, but it brings too much of its previous identity and mechanics for modern shooter fans to easily grab hold of the way they could with something like Destiny. Instead of being a personality crisis, I think this can be parlayed into a strength if id plays their cards right – a fine blending of chocolate and peanut butter that could very well find its own audience in a comfortable Quake III-Halo middle ground. But I could be biased. id has never made a game I’ve disliked, and if there’s one thing I learned from Halo Reach, it’s that I will forgive a game for a lot of things if it forces me to find health packs. Funny, I’ve only ever liked two Halo games enough to ever finish their single-player mode, and they’re BOTH the ones with little first aid kits. I don’t know what that says about me.